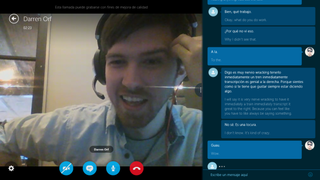 Skype Translator is an amazing feat of engineering, even if it isn’t perfect. But reports suggest that, in Chinese at least, it has somewhat of a potty mouth. A glitch in the beta software misinterpreted the words I spoke. “It’s nice to talk to you” was translated as “It’s f*cking nice to f*ck you,” and other synthesized profanity, like the icebox robot in 1970’s sci-fi flick Logan’s Run, but with Tourette Syndrome. Carter lays the blame at the feet of the The Great Firewall, which he claims “obstructs the Skype system from working consistently.” Which it could be—or it could just be internal bugs that can’t cope with the voices they’re attempting to translate. Either way, it seems Skype’s AI translation has a way to go before it’s used as a diplomatic tool.